The power of the focused mind is a power beyond comprehension. Drive By, Muertos Gang Member, Raymond Flint, Silhouette: Stealth Operative, Infiltration, Satellite Uplink, Snitch and Emergency Shutdown all combo with this console remarkably well and can really create economic heartache for an unprepared corp. As Blackguard is currently absent in the meta, it makes the synergy all the more unexpected. 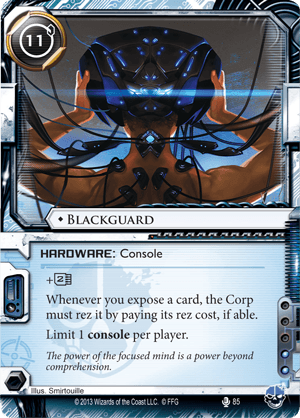 But it's expensive to get out, and once it is out, the corp could protect themselves very cheaply with Underway Grid, assuming it becomes more prevalent in the meta. The only viable ways to install it for cheaper at the moment are Street Peddler (nice synergy with Armand "Geist" Walker: Tech Lord and opens up surprise plays for the runner that the corp won't see coming), The Supplier and Modded, and none makes it cheaper than 8 to install, barring ridiculous Eureka! or Trade-In jank.